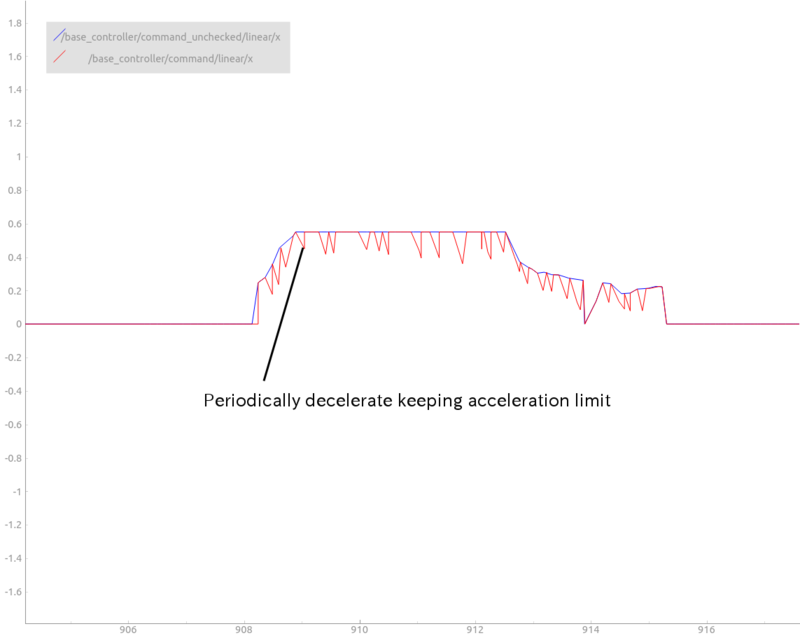 Interpolate velocity command to be published periodically with acceleration / deceleration limit. Basically this node interpolates velocity not to violate acceleration limit by decelating from last received velocity. For example PR2 has 10Hz control loop in base_controller and if no cmd_vel has come within 0.1 seconds, the controller stops all the moving motors for safety. If move_base node publishes cmd_vel lower than 10Hz (let it be 5Hz) but continues publishing, controllers send signal to motors forward for 500ms and stop for 500ms, which causes "rattle" (= moves and suddenly stops repeatedly) and can damages motors and other hardwares. limit value of x-axis translational acceleration. This node publishes velocity not to violate this value. limit value of y-axis translational acceleration. This node publishes velocity not to violate this value. limit value of z-axis rotational acceleration. This node publishes velocity not to violate this value. Max message count to be published from last received velocity command. This package is originated from the discussion in https://github.com/ros-planning/navigation/issues/405 . I have not looked into detail of implementation but it seems that similar nodes for turtlebot robots exist: https://github.com/yujinrobot/yujin_ocs/tree/devel/yocs_velocity_smoother .